"Apple has made a clear showing that, in the absence of a preliminary injunction, it is likely to lose substantial market share in the smartphone market and to lose substantial downstream sales of future smartphone purchases and tag-along products," Judge Koh said in Friday's ruling. First of all, this seems to be yet another admission by Apple that it just can't compete in the marketplace against Samsung. Such a ruling seems to scream out to potential buyers: hey, check out the devices that even Apple admits you'd want over its own. But, more importantly, "losing substantial market share" is what competition is all about. If someone comes out with a better product, then the other company should lose substantial market share. That doesn't deserve an injunction. That harms the market, who clearly -- even by Apple's own admission, apparently -- wants the other product more. The fact that two phones will compete is no reason to ban a phone. Let them compete. Let the market decide. Even more bizarre is why an injunction should be issued at all. Following the MercExchange decision, courts are only supposed to issue injunctions in exceptional cases. If it's an issue that can be dealt with by requiring a royalty, then there's no reason to issue an injunction. Samsung, of course, is appealing this and asking that the injunction be put on hold until that appeal is heard. 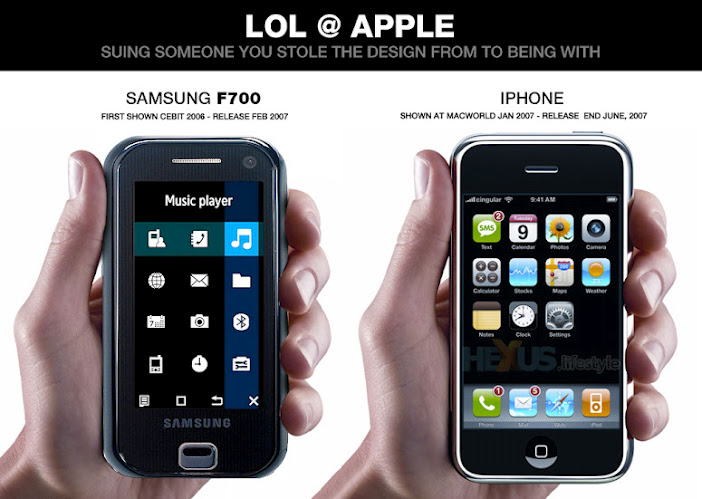 In the meantime, some are pointing out that, for all of Apple's insistence that Samsung copied the designs of its phone and tablet from Apple, you could easily make the argument that Apple got some inspiration from Samsung as well: And really, that's the point. Innovation and advancement involve all sorts of copying, but also improvements. It goes back and forth. Attacking one party for copying another misses the point, limits competition and harms consumers. It's too bad the US patent system and the courts now want to aid that process. Considering Apple only exist in name because they used the name of an existing corporation (Apple Corps) and agreed to not enter the music business�which they later did�(http://en.wikipedia.org/wiki/Apple_Corps_v_Apple_Computer), and that they have at the very least taken inspiration from previous designers (http://gizmodo.com/343641/1960s-braun-products-hold-the-secrets-to-apples-future), they should probably get off their high horse.